Commander 2017 has graced us with a host of new tribal commanders, from Cats to Dragons to Cat Dragons. 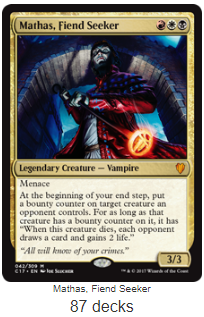 However, for this week’s Commander Showdown, I’d like to take a step back from all the tribal synergies and focus instead upon a strange and intriguing new inclusion to the ‘Vampiric Bloodlust’ precon. His name is Mathas, Fiend Seeker, and he’s out to put a price on your head. A succinct 3/3 for three mana, Mathas has the peculiar ability to put bounty counters on your opponents’ creatures, branding them as Public Enemy No. 1. Whenever a creature with a bounty counter dies, Mathas rewards everyone with a little life and an extra card—that is, everyone except the creature’s controller. The political implications here are already apparent—Mathas is a Fiend Seeker, but also a Friend Seeker, as he grants bonuses to some players but not to others. You may be able to entice your opponents to do your dirty work for you by painting bright red targets on the most dangerous threats on the board. With any luck, opponents may be less inclined to destroy your creatures when they can be rewarded for removing someone else’s instead. So, has Mathas come to usurp Marchesa’s throne? How do these two Mardu politicians differ in style and strategy? Let’s take a look. As excited as I am to discuss Mathas right away, I think Queen Marchesa would have me assassinated if I didn’t discuss her first. Marchesa oversees an impressive 1175 decks here on EDHREC. Alongside such aggressive commanders as Kaalia of the Vast, Alesha, Who Smiles at Death, and Zurgo Helmsmasher, Marchesa provides a breath of fresh air for Mardu players who prefer to take their time, rather than rush headlong into battle. Marchesa introduces the Monarch token into the game, an emblem-like token that draws you extra cards. This can dramatically change the landscape of the game, as the monarchy passes from player to player via combat damage. Once you become the monarch, other players may begin eyeing you greedily from across the table, hungry for the extra card advantage. Thankfully, Queen Marchesa mitigates this potential aggression with a few extra abilities. For one thing, she has deathtouch, which can deter opponents from attacking you. 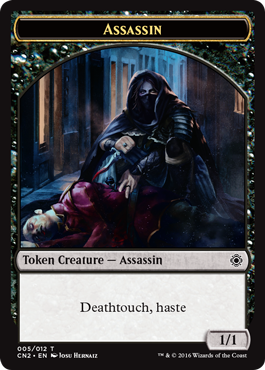 For another, if Marchesa loses the crown, she’ll create a difficult-to-block 1/1 Assassin token with deathtouch and haste to help you take it back. Lastly, if you lose not only the monarchy but also your commander, Marchesa can immediately reclaim the throne just by reentering the battlefield. Naturally, Marchesa would rather never lose the crown in the first place, so it’s no mystery how players tend to build her deck. 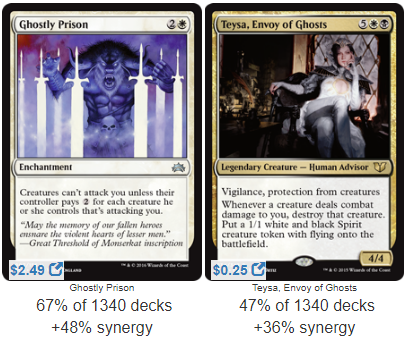 Taking a glance at her Signature Cards section, we find that more than half of them are Ghostly Prison-type effects. No joke, seven of the twelve Signature Cards for Marchesa are there to deter attacking creatures. Some tax your opponents, either with mana, like Sphere of Safety, or loss of life, like Marchesa’s Decree. Others create blockers, such as Kazuul, Tyrant of the Cliffs. Others still will straight-up destroy any creature that harms you, like Teysa, Envoy of Ghosts. No matter the method, Marchesa is committed to building a pillowfort and keeping her crown. Keeping the crown is vital since Mardu (and Boros in particular) is famous for its relative inability to draw extra cards. Beyond that, building a pillowfort is also a great political tactic. Kynaios and Tiro of Meletis decks often do the exact same thing. When it’s even mildly cumbersome to attack you, it’s easier for your opponents to justify attacking each other instead. That’s exactly what Marchesa wants: her opponents to bicker and fight amongst each other while she sits back comfortably, slowly accruing card advantage. Obviously Marchesa hasn’t been updated enough to include Disrupt Decorum, which is possibly my favorite card from the entire Commander 2017 product. Affectionately dubbed “Wrath of Goad,” this new spell is everything Marchesa wants in life, so make sure to mentally slot it into the list above. 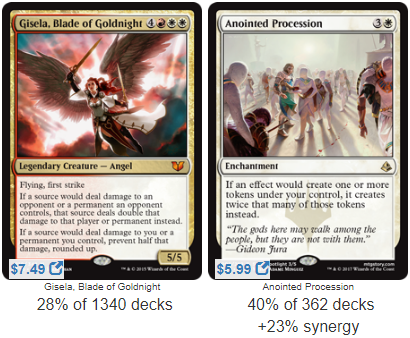 I’m happy to see some Boros cards entering the fray, particularly Gisela, Blade of Goldnight. This is a fantastic card, both for politics and ending the game. Gisela stunts all damage that comes your way, making it even less appealing for players to attack you. Better yet, she doubles all damage your opponents take. Not just from sources you control—from anywhere. Once again, this encourages your opponents to attack each other to get in on that sweet double-damage action. Plus, when there’s only one opponent left, Gisela tips the scales heavily in your favor. She deals a quarter of their life total in one swing, after all. Cards that double as political capital and good game-enders are excellent inclusions to this deck. Perusing the average decklist, my eye is drawn to a fairly recent card: Anointed Procession. At first, this seems like a natural inclusion, since Marchesa makes assassin tokens. However, as previously mentioned, Marchesa would really rather never lose the monarchy. You probably will at some point in the game, but making assassin tokens is Plan B, not Plan A. This doesn’t seem like the proper way to abuse Anointed Procession. Making two Assassins instead of one just seems a little underwhelming compared to the way a Trostani, Selesnya’s Voice deck would abuse this enchantment. I shouldn’t be so quick to sweep Anointed Procession aside, though. I think it actually hints at one of Queen Marchesa’s primary win conditions. Looking closely at her decklist, we find cards like Elspeth, Sun’s Champion and Assemble the Legion, which are fantastic inclusions for swarming the battlefield with tokens. Anointed Procession increases the potency of your army, overwhelming your hapless opponents. In fact, we see many cards here that synergize with token strategies. 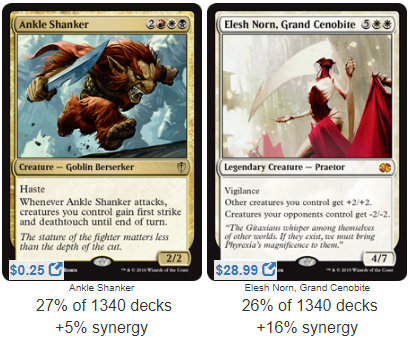 Elesh Norn, Grand Cenobite dramatically increases your army’s power, while Ankle Shanker and Iroas, God of Victory make it very tough to block. With enough creatures, Brutal Hordechief is indeed brutal. These are great cards for tokens, but… this average decklist seems to contain more token-synergy cards than actual token-makers. What’s that about? I have a theory about this, one that I discussed back in my Group Hug Showdown. Decks like these are designed to take opponents by surprise; Marchesa can’t stab people in the back if they already know what’s coming. As a result, win conditions for political commanders will often barely scrape more than 30% popularity here on EDHREC, as political players tend to build their decks with an eye toward variety and unpredictability. There are numerous ways to create tokens in Mardu colors, from Martial Coup to Grave Titan. Each is powerful in unique ways and depends upon your meta to reach their full potential. For example, some groups might immediately target you if you drop a Luminarch Ascension, making it a liability instead of a win condition. Others might let it pass. Your buddies may be too distrustful of your political schemes when you cast Tempt with Vengeance, while strangers at your local game store are happy to take you up on your Tempting Offer. There is no single best politically-charged-token-producing card, hence the low popularity for token-makers in this list. People are running them, they’re just not running the same ones. It takes trial and error to find the best cards for your personal meta. If tokens are your preferred method of victory, take a hard look at the cards that produce them, even if they show low popularity here on EDHREC. Low popularity doesn’t necessarily mean the cards are bad. It means your opponents won’t see them coming. I have more thoughts about Marchesa’s win conditions, but we’ll have to put them on hold for a moment. It’s time we discuss our new bounty hunter, Mathas, Fiend Seeker. Mathas is also a political commander, but in a different vein than Marchesa. Mathas slots into the Group Hug archetype because he gives gifts to multiple players. This is a departure from Marchesa’s brand of politics, as she really wants to keep the crown to herself. She may engage in political favors, but there’s a distinction between politics and Group Hug. Most Group Hug decks rely upon politics, but not all political decks like hugs. Now, a quick note about his ability—when Mathas puts up a “WANTED” poster, he only cares if the creature dies. He doesn’t need to be on the battlefield when that creature dies since he gives that creature the death trigger, but it does need to hit the graveyard. If the creature is bounced, tucked, or exiled, you won’t get a reward. Swords to Plowshares is an excellent spell, but it won’t trigger the bounty. 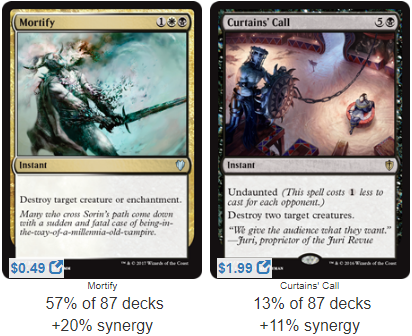 It’s probably good enough to justify running anyway, but we’re looking for cards like Mortify and Curtains’ Call. In fact, Mathas’s ability is essentially useless against commander creatures. If a commander is destroyed and placed back in the command zone, that doesn’t count as a ‘dies’ trigger. It won’t gain you life from a Fumigate, nor will the new Heirloom Blade trigger if it was equipped to that commander. This is why Reyhan, Last of the Abzan is worded so carefully to include both death and the command zone. Thus, Mathas is interested in putting bounties on the minions of the deck, rather than commanders. This seems unfortunate at first, but I’m not actually sure it’s too much of a drawback. Players are already incentivized to take out enemy commanders, regardless of Mathas. Many of the best removal spells in the game don’t say the word ‘destroy,’ such as Path to Exile and Chaos Warp, so your opponents will probably save those for the bounty-less commander creatures, and find different ways to kill off the minions you’ve marked for death. Curse cards are also incredibly funny, effectively placing bounties on players, not just their creatures. 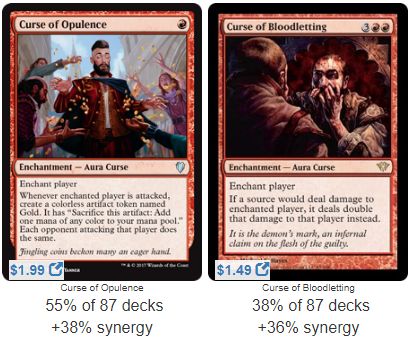 Curse of Opulence and Curse of Bloodletting are particular standouts. (For more ideas on curses, you can check out Sam Alpert’s curse-tastic list here.) Be careful how many curses you put out there, though. If your deck inconveniences too many people, they might all decide that you’re the juiciest target at the table instead of each other. Balancing that psychology is vitally important for political decks. A friend of mine recently rifled through my Group Hug deck and remarked, “You have a lot of removal in here.” Frankly, it’s true. Removal spells are among the best political cards in the game. A Terminate can be just as effective as a Ghostly Prison if it deters an opponent from attacking you. Hero’s Downfalling a Jin-Gitaxias, Core Augur can make you a friend on the other side of the table. You can even use Mathas’s ability as a bargaining chip, sparing an enemy creature from bounty counters as long as they promise not to attack you with it. Timed correctly, the threat of removal can make or break alliances and keep your life total nice and healthy. That, I think, is the main takeaway for Mathas, and the primary difference between him and Marchesa. Marchesa is a political commander, but a neutral one. She wants to sit back and watch, abstaining from every fight until she sees an opening to strike. Mathas is more involved. He’s a proactive member of the game, constantly pointing out the biggest baddies on the board, and he’s incredibly selective about his friends. He too wants to sit safely behind a wall of enchantments, but he stirs the pot while doing so, sowing enmity between other players and taking advantage of their greed. While Marchesa can get away with being pacifistic, Mathas sculpts the political landscape of the game, and will likely have a hand in many of the decisions your opponents make. There are many commonalities between this deck and Marchesa’s, such as the Ghostly Prison effects. I’m personally a fan of the interaction between Mathas’s bounty counters and No Mercy. What a way to deter aggression—the attacking player will not only lose their creature, but give everyone extra cards! There’s also the obligatory Bounty Hunter, which is a fun addition. It’s worth pointing out that Mathas’s bounty counters enable Bounty Hunter, but Bounty Hunter’s counters don’t enable Mathas’s ability. Regardless, it’s too cute an interaction not to include in the deck. Possibly my favorite card is Death by Dragons. It’s not the most powerful card out there, but it perfectly echoes Mathas’s ability to help everyone except one player. This deck is capable of some real chaos, and a little chaos is essential to knock your opponents off balance and sneak in for the kill. Politics can only take you so far in EDH. Once it’s down to you and one other opponent, you need to have a path to victory in your back pocket. As we saw with Queen Marchesa’s deck, tokens are one method of snatching a win. They’re fragile, though, since most players run several board wipes in their decks. I’d like to suggest another victory tactic, one that I think will really take your opponents by surprise: using their own weight against them. In Commander 2016, we received the card Treacherous Terrain, which punishes your opponents for each land they control. This was the perfect inclusion for Kynaios and Tiro of Meletis, who give their opponents more lands. Treacherous Terrain is off-limits to Mardu decks, obviously, but it’s still the type of card Queen Marchesa and Mathas, Fiend Seeker should pay attention to. Cards like this turn your opponents’ advantages against them, letting you clinch victory out of nowhere. The most obvious example of this concept is the famous Insurrection, which turns an enemy army into your army. There are some players out there who consider this a cheap card, but I’ve said this before and I’ll say it again: if there’s any deck that deserves to win the game with Insurrection, it’s Group Hug. Giving other people tons of bonuses and then taking them all away is a carefully crafted strategy, not just a lucky win. 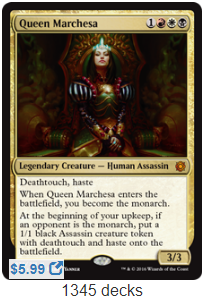 Marchesa isn’t necessarily a hugsy commander, but I still think this is a fine card for her just for flavor reasons; she became queen by organizing a massive coup, after all. Another example of this “use your opponent’s weight against them” concept is Deflecting Palm. The number of times my buddy’s Queen Marchesa deck has killed me with this ruddy card is frankly embarrassing. Is Xenagos, God of Revels sending a 40/40 your way? Is Mizzix of the Izmagnus trying to cast a Comet Storm for 300? Deflecting Palm saves the day. It’s not perfect, but it’s a big surprise, and it doesn’t even care if the deflected creature has hexproof. Boros Fury-Shield and Comeuppance offer similar effects, but with more restrictions. Sometimes your opponents don’t have just one big threat, they have hundreds! What do you do about them? Recruit a Selfless Squire, of course. She prevents damage from all sources and cracks back for an insane amount of damage next turn. Don’t stop there; Rakdos Charm has several useful modes, and one of them can win you the game. Timed correctly against the right opponent, this can be seriously deadly, forcing each creature to deal one damage to its controller. The oft-forgotten Deadly Tempest and Incite Rebellion are just as useful, punishing opponents for their arrogance. These cards are genuinely better than they look. If your opponents have too many creatures, it’s death by a thousand cuts. Each of these is situational, it’s true, but that’s how political decks win: through flexibility and adaptation. 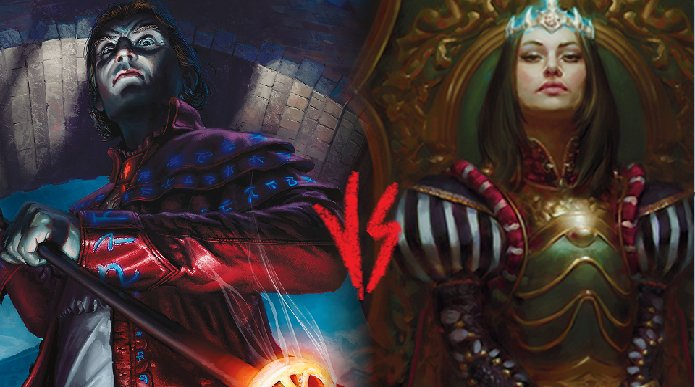 Heck, just last week Rick Amundson wrote up a Mathas list that wins using reanimator spells! There are many paths to victory, so be prepared for anything. You can be sure your opponent will have a plan, so use their momentum to your advantage. Sometimes, the best offense is your opponent’s offense. Before I go, there are a few more cards for each commander I want to talk about. Sadly, these cards don’t see nearly as much play as they deserve, so I’m becoming a Mardu politician and campaigning on their behalf to get them elected into your deck. Volcanic Offering: This card is in less than 2000 decks, which has to be some sort of crime. Volcanic Offering destroys two lands and two creatures, none of which can be yours. It’s Curtains’ Call stapled to a Rain of Salt. All it requires is a little input. This card is bonkers good in any red deck, but it’s even better here, where your opponents are happy to choose creatures with bounty counters on them. Kulrath Knight: This card is a little cheeky, but I love it. Creatures with counters on them can’t attack or block? Mathas likes that. This turns him into Gwafa Hazid, Profiteer, but creepier-looking. Sunforger: Someone cast a Damnation? Run and get your Boros Charm. Unfriendly creature? Fetch out that Mortify. Are they swinging for lethal? Time to find that brand-new Teferi’s Protection. It slices, it dices, it makes Julienne Fries. Doesn’t hurt that it makes Mathas a 7/3 with menace, either. Alhammarret’s Archive: Because drawing one card and gaining two life isn’t enough. This card is just delicious. Forbidden Orchard: and Arcane Lighthouse: Lands are always crucial to any well-tuned deck, and these are especially useful for Mathas. Need a creature to put a bounty counter on? Forbidden Orchard will make one. Want to put counters on creatures with hexproof? Better yet, want to make sure your opponents can help you kill creatures with hexproof? Arcane Lighthouse has your back. Both are excellent political cards already, but in this deck, they’re way too good to pass up. Crown of Doom: The monarchy isn’t the only crown out there, only this is the crown you don’t want. Luckily, your opponents can never give it back to you! Crown of Doom is a mischievous little artifact reminiscent of Gahiji, Honored One. It’s great for politics and even better if you have lots of tokens. Delirium: and Backlash: That’s right, Delirium isn’t just a mechanic from Shadows over Innistrad. These are simple spells, but they fight into the “opponent’s weight against them” category from before. White spells like Deflecting Palm or Comeuppance are excellent, but they rely upon combat. Delirium and Backlash get around that restriction and just deal some damage. Can you imagine using one of these on a huge creature with infect? Brutal stuff. Mob Rule:. This card is a smaller version of Insurrection, but it’s often just as good. The modality lets you take advantage of any board you encounter. Chandra’s Ignition: This is my silly pick. I just think it’s hysterical to cast this and have Marchesa’s deathtouch annihilate the board. There’s also Viridian Longbow to ping things down. The point is, Marchesa has deathtouch, and it makes sense to take advantage of that fact. Mystic Barrier: This carad is absolutely disgusting. After discussing Incite Rebellion, Volcanic Offering, and Crown of Doom, the theme of this Cards to Consider section should be “don’t underestimate cards from the precons!” Precons are often stuffed with excellent multiplayer cards, and Mystic Barrier is one of them. Why worry about three different opponents stealing your crown when you can worry about just one of them? The one with the least-threatening creatures, in fact. True, this card doesn’t do anything when there’s only one opponent remaining, but until then, it stymies aggression and gives you a lot of control over the board, perfect for Marchesa’s schemes. The art of politics is subtle, and the differences between these two commanders are more subtle still. Mardu is traditionally known for its brazen aggression, but Marchesa and Mathas remind us to take our time. As stated on Marchesa’s Decree, it’s unwise to seize power until you have the means to hold it. Keep your eye on the crown, distract your enemies by branding others as more important threats, and remember: wrapping everyone in a great big Group Hug is the perfect opportunity to stab them in the back.